Competition in the IT business is still tough, though there are many entrenched players. Targeting new customers and retention of existing ones is crucial for all players. Pre-sales activities represent a very important step towards acquiring new customers. IT players are concerned over improving their efficiency. Experienced companies pay much attention to pre-sales, and their pre-sales teams include highly qualified salespeople and technicians. Such a team may place a large financial burden on a company, while just 10% of leads turn into closed sales. Sometimes pre-sales teams deal with customers who has only a general idea of a project, while its detailed description is missing, are the ones each pre-sales team is willing to acquire. Such customers are “dreamers” and they often do not have appropriate technical background. They do not understand how complex the task is. Vendors suggest such customers to sign an agreement to develop a system specification or a business description of the project. However, customers usually do not agree to ink an agreement since they believe that they can create a detailed description of the project or they cannot understand importance of this stage of the project. They cannot realize why they have to pay for something that does not world (documentation, in particular), while such descriptions, as a rule, are prepared by IT experts. What Solutions Can Be Offered To A Customer? Agile development seems to be a good idea in such a case. The Agile model has a number of important advantages: face-to-face conversation enabling to understand all customer’s needs, a high level of cooperation between a customer and developers on a daily basis, an ability to adapt a project to any required changes, and more. On the other hand, this approach does not allow to give precise estimation of a total cost of the project. Besides, customers cannot recognize all potential risks and start hesitating about ordering such a project. An interview and rough estimation of a project’s cost is one more solution. Real experts can roughly estimate a project’s cost following an interview with a customer since they have previously participated in a range of similar projects. But there is another problem – the estimation may be not accurate enough making a financial risk high for a vendor. Design-driven sales. This approach seems to be the best solution in such cases. • Visual representation can be understood much more easily than a textual description. A customer will be more loyal to a prototype of interface than to a system specification. • Changes and corrections can be made easily at this point since there are no limitations in terms of graphics. Any idea of a customer can be reflected in a draft design. However, it should be noted that app developers may not implement all the ideas of a customer in future. The main task of the pre-sales stage is to get loyalty of a customer. • A customer can see visual representation of his/her ideas in the form of a real interface. This approach enables a customer and a vendor to gain understanding of problems the project has while working on a UI prototype. And it is more likely that a customer would agree on development of a system specification. • Low cost. Working hours of a UI/UX designer are much cheaper that the ones of a system architect who creates a system specification. • Adding a case study to a design portfolio. The pre-sales stage creates content for new cases that can be used thereafter to prove design competence of a vendor. Where Can Design-Driven Sales Approach Be Applied? This approach can become a solution when it comes to mobile app development where visual representation is highly important. Web-driven services like development of company websites, social networks, online stores, etc. can be one more application field for such sales. 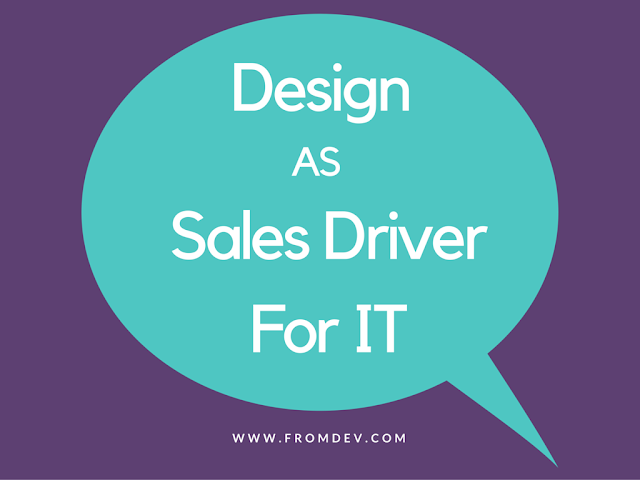 Design can become an important tool enabling an IT vendor to make sales and create loyal customers. Besides, new cases can be added to an interface design portfolio to be shown to new customers. Tatsiana Levdikova is a websites design and development expert at EffectiveSoft, a custom software development company. This company unites more than 250 experts: software developers, engineers, scientists, and more.